Vampire Weekend fans can now rejoice! 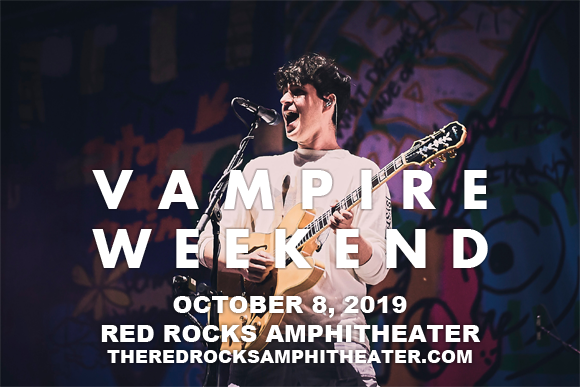 The indie-rock trio comes to Red Rocks Amphitheater on Tuesday 8th October 2019 in support of their eagerly-awaited fourth studio album, Father of the Bride, performing new material like singles “Flower Moon,” “Harmony Hall,” “2021,” and “Sunflower”! The band play Red Rocks as part of their Father of the Bride Tour, which is the biggest of their career so far! Vampire Weekend is an American rock band that came to prominence with the release of its self-titled, self-produced 2008 debut album. The album went straight in at number 17 on the Billboard 200 and launched four singles: "Mansard Roof", "A-Punk", "Oxford Comma", "Cape Cod Kwassa Kwassa", and "The Kids Don't Stand a Chance". Contra (2010), the album's follow-up, cemented their popularity, becoming one of the year's most talked-about albums and debuting at number-one on the Billboard 200. The band won the 2014 Grammy Award for Best Alternative Music Album for their third record, Modern Vampires of the City (2013). Their fourth studio album, Father of the Bride, is due for release in 2019.